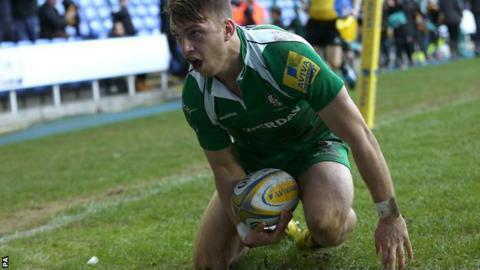 London Irish winger Alex Lewington admits a call-up to Eddie Jones' first England squad would be a surprise. Jones will name his first squad since being appointed England head coach on Wednesday for the upcoming Six Nations. Injuries to a number of in-form players mean the Australian could call-up some unfamiliar names with Lewington, 24, a potential contender in the back line. "With a couple of injuries, you never know. It would be amazing if a surprise call came through," he told BBC Sport. Lewington has scored two tries in his last two games to help London Irish move off the bottom of the Premiership. But the former Leicester winger, who represented his country against the Barbarians in May, has not spoken with any of the England coaching set-up this season. "They've got a lot of things to worry about having only been in post since last month," Lewington said. "I'm probably not as high up on the priority list as a lot of other selections they've got to consider. "But, with the injuries in the last couple of weeks, I would hope I'm in the mix to be an outside chance potentially."